I had a jimny, loved it, but moved on to a swb commercial landcruiser. Can't beat it. I’ve had my terios I bought off here for £700 . I drive it through bushes, ditches and just don’t care. It’s soooo funny and my kids love it. ive used it feeding the duck ponds all last season and it never gets stuck but for a 1.3 auto it’s pulled a frontera and mx6 out of the ditches . They said it wouldn’t work. One of my farmers has a Pinin for the last four years and that's still going strong. TT that still looks pretty smart. I am in a similar position looking for a shooting car. Sold my LWB teranno which was fantastic but getting old and i let it go when the opportunity presented itself. Ever since then i have been on the lookout for something suitable and can not find anything that quite fits the bill and yet is frugal on fuel . X trails are ok but i have looked at a few and driven a mates a lot and they just do not do anything for me . Two cars are on my short list at the moment i have mates who have both and i like everything about both of them. These are in order of preference Jeep Cheroke patriot or liberty 2.0 CRD manual. or a Mitsubishi outlander or forwork version. Both these cars have 2.0 litre TDI VW diesel engines and they are a nice drive good off road and under your 3 k budget. I like the jeep the best my mates is a big mileage 269 000 miles 2008 (57 reg) he got it used with 140 000 miles on it 4 years ago he has done 30 000 in it a year and apart from servicing its needed very little the alternator clutch pulley disintegrated at 180 000 miles he had a weeping power steering pipe picked up by mot last year he just had to tighten up , and apart from tyres last year its been reliable. its good off road comfortable and a nice drive. VW 2 litres are apparently prone to turbos giving trouble, but mate has had no trouble but he changes the oil regularly perhaps this has helped with reliability of turbo. You can get a Jimny for your 3k that will be great off-road. Finding a decent Vitara will be difficult as they are bought and modified as offroaders being bigger than a Jimny with more power they offer more potential. If your looking for a mainly on road car the diahatsu terrios like tt has are great. The engines are Toyota Yaris 1.3 units. For a bit more you can pick up the early Dacia duster a with 1.5 diesel engines, good on fuel and will go where you want with at tyres. One or two petrol ones under 3k too. Ive got a lot of history with Suzukis.... 3 SJ410’s which were brilliant! 2 petrol lwb vitaras and now on my second swb petrol GrandVit. First was a Y reg which had been in the wars a bit before I got it.... accident, put back together, bad respray, fat wheels, window tints. Changed to sensible wheels and tyres and it did me well before it would have cost more to put in a new clutch than it was worth so I stripped off the good bits and scrapped it. It did have a problem with stopping when it was stopped in traffic or just out rabbiting on tickover and I eventually nailed that down to a duff crank position sensor (confirmed by pouring cold water over it when it next happened). Easy enough to work on too. I’ll have had the current 05 with the updated interior over the 01 but pre-face/body lift for 4 years come June...cost me £1400 to buy and it’s sailed through its mots on the annual service, only had new tyres in that time, its my daily run around and gives me around 330miles to a tankful at a £58 odd fill from the light flashing. This pre-facelift model has the flat rear bumper and I’ve shot a lot of foxes stood on that (or one of the rear wheels) and shooting off the roof. Took me a while to actually find a good one and I’ll be gutted when it finally comes to and end. 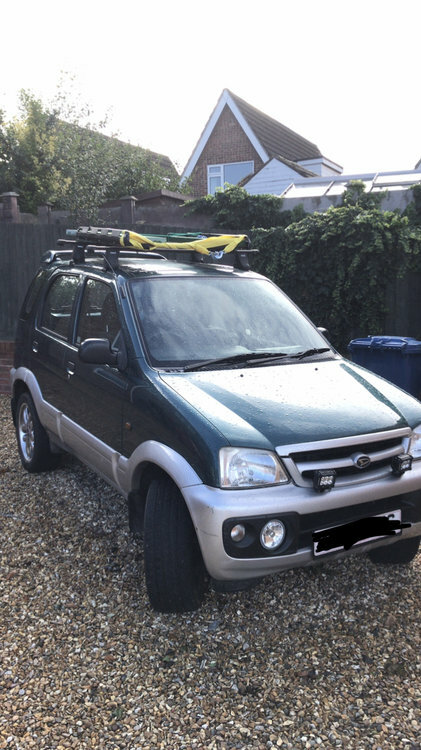 Replacing it will be a difficult choice but I’ve got half an eye on a Japanese import Suzuki Carry or Honda Acty 4x4 pick up truck but they’re pretty expensive for what they are....although not as pricey as the converted Jimny’s. Hmmm.....never had a problem with rusty sills on either GrandVit. I’ll keep an eye on those.